Do you have a camper where you intend to spend a significant amount of time? Wherever you’re headed and however long you intend to be gone, having a bathroom is one thing that will make your trip more pleasant. Have you been avoiding campers because you dread long trips planned entirely around your next rest stop? Can’t stand the large, crowded bathrooms at truck stops? 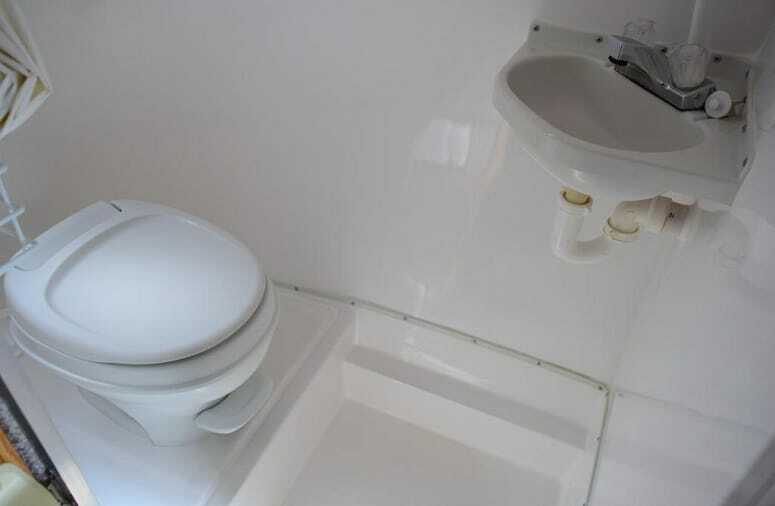 If you’ve been hesitant to bring home a camper because you think you’ll be giving up your bathroom, you might be pleasantly surprised by the options available. Campers weigh less and are easier to tow. They fit more places and you’ll have more flexibility with your hauling vehicle. And now you can have it all—along with that bathroom you crave. If you’ve been looking for a camper that can sleep a whole family and still has room for a bathroom, don’t overlook the Jay Sport by Jayco. Like most other campers, this one is offered in a variety of sizes, with features you can opt into. Whether you need a model fit for a single occupant or one that can sleep eight people, Jay Sport has something to suit your needs. If you purchase this camper new, you can fully customize the space to suit your needs. With a list of optional extras that include a toilet and shower, this is the kind of camper that can take you where you want to go. This series is a folding pop-up camper. When traveling, you’ll have your camper in a fully collapsed position, which is great for your gas mileage. Campers are lightweight, low-sitting, and create little drag. You’ll need to pay attention to how you pack and utilize storage well. With a little bit of planning and effort, though, this camper can be just the compromise you’ve been looking for—the ease and value of a pop-up with the luxury of a bathroom. If vintage campers appeal to you, you may be interested in this Airstream line. Airstream has long been a popular name in the RV and camper industry. Airstream is known for the quality of its products and their unmistakable look. The classic shape and metal exterior of the Airstream Sport will leave you feeling like you’ve stepped back in time. This camper has a timeless feel, but not everything about it is from a bygone era. You’ll love how this camper seamlessly blends the vintage feel with modern convenience. This is a small camper (available in 16 and 22-foot lengths) that packs a punch. The compact space is maximized with space-saving amenities, like a sink cover that doubles as a cutting board and a fold-down stove cover. This Airstream model sleeps up to 4. In addition to the bed in the bedroom, a convertible dinette can provide sleeping accommodations for two. The great floorplan and luxurious finishings are no more apparent than in the bathroom. The metal sink is equipped with a Moen faucet. In the shower, you’ll love the handheld showerhead and the retractable clothesline. The crisp white interior and the well-utilized space leave the bathroom floorplan feeling spacious. If you’ve been looking for a camper that evokes the past while boldly embracing the convenience of today, the Airstream Sport may be what you’ve been looking for. If you’ve been looking for a little camper that can do it all, the iCamp Elite more than fits the bill. Its attractive and low-maintenance design will be turning even those who’ve been reluctant to give RVing a try into dedicated fans. We know you will love this easy to care for RV, with a modern classic look. We also know you’re really here to learn about the bathroom this model has to offer. The iCamp Elite offers a modular bathroom that includes both a shower and a toilet. The interior is light and bright and brings with it the retro whimsy we can’t get enough of. If you love the outdoor life and the freedom that comes with a camper and RV lifestyle, we don’t need to sell you on the good points. Now you can have all the things you crave, without sacrificing convenience. 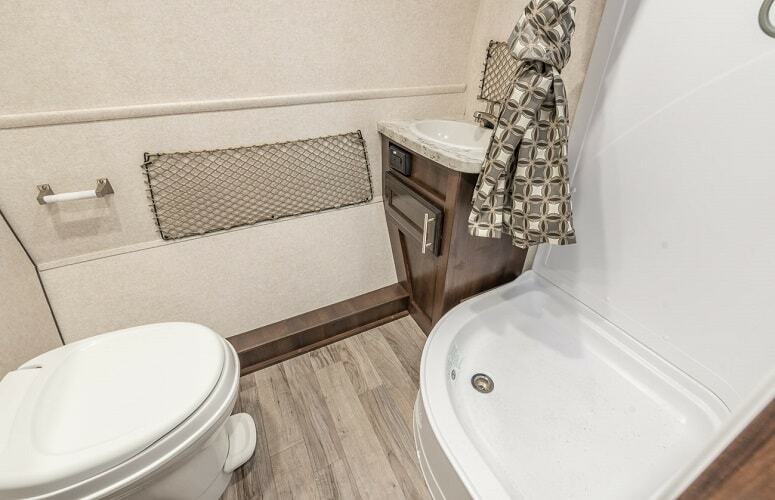 Stop making your plans around your next bathroom break and bring home a camper that’s fully equipped to make your life—and travel—easier. Have you been on the hunt for a small trailer with all the amenities? One that will still suit a family for amazing road trips? The Casita Spirit Deluxe Trailer might be just the gem you’re looking for. If you’re looking for a camper with amenities, this one hits the spot. An awning, multiple sleeping spaces, a sink, stovetop, and a refrigerator with freezer are all part of the package. It’s a small space that aims to deliver all the comforts of home. We love small campers—sometimes choosing something small means sacrificing little comforts. An indoor shower is often one of the things that have to go. While outdoor showers will certainly get you clean, they can be laborious to set up. If the weather isn’t favorable, it’s unlikely you’ll get the shower you want. None of that applies to this little Casita Spirit Deluxe, though. 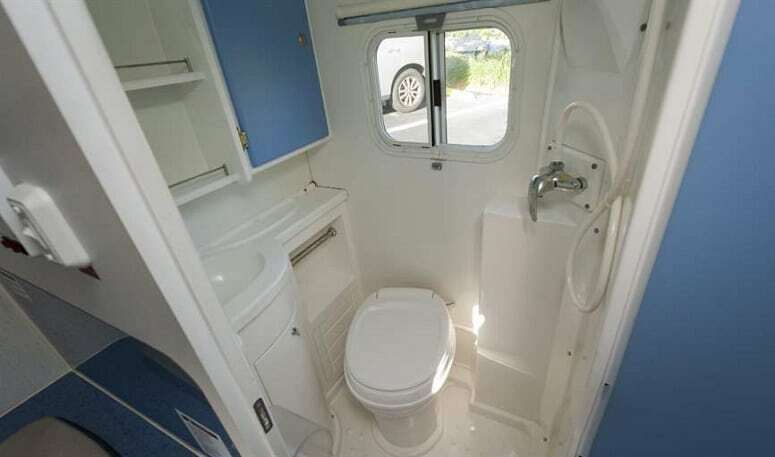 This is one time where you can have a small size and still have a fantastic bathroom—complete with a shower inside your camper. The Casita Spirit Deluxe is available in both 16- and 17-foot lengths. It’s able to sleep up to six, with two separate sleeping areas. 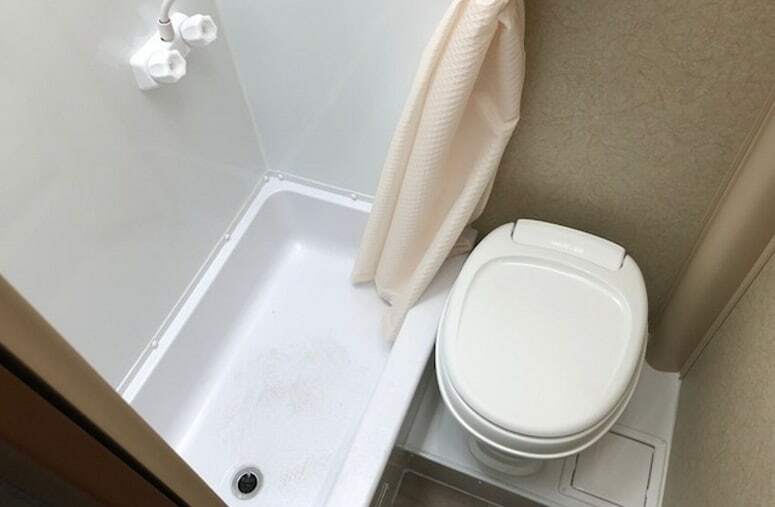 The spacious bathroom includes a toilet and a shower. You’ll love the window, the washbasin, and the crisp clean feel to the bathroom. This video from a YouTube user shows the inside of the Spirit Deluxe. Ultra-light and packed full of amenities, the Jayco Hummingbird is a great option for a small camper that comes complete with a bathroom, including a shower, toilet, and washbasin. Ample storage, plenty of light—including a skylight, compact kitchen, and a Murphy bed, will give you the airy feeling of space and luxury. Prepped for solar power, this classic teardrop style trailer is anything but outdated. You’ll love the residential-style aesthetic of the interior and the details that have gone into this trailer’s construction. This trailer easily accommodates bicycles and extra gear. It may be small in size, but you’ll love the extras that come with it. The Lance 1575 is a small trailer that’s loaded with options. Featuring a stove and oven, a large refrigerator with a separate freezer, and a bathroom with a shower, this trailer is full of luxurious living. It’s always nice to find a camper with a bathroom. If the bathroom also has a window, that’s even better. The Lance 1575 outdoes them all with its spectacular shower skylight. Not only do you have an indoor shower and toilet, but you also have natural light that provides an open and airy feeling. If you’re looking for all the fun that comes with the camper lifestyle but don’t want to feel like you’re settling for the experience, the Lance 1575 is a good option. 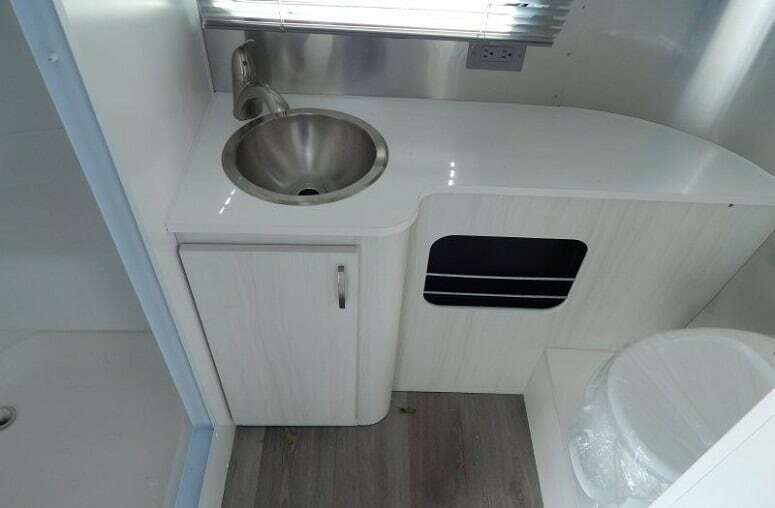 The stainless steel kitchen sink and the oversized windows with ample storage spaces will leave you feeling like you’re at a top-of-the-line hotel instead of tucked away in a camper. There’s no need to skimp on the good life when you’re traveling with your trailer. This travel trailer is a prime example of how you can have it all. The Timberline Camper is a great little camper that boasts a bathroom. The amenities don’t stop there, though. Looking for a camper that uses solar power and can sleep up to five? Love a clean and modern aesthetic? If that sounds like what you’ve been searching for, the Timberline might be for you. The shower/toilet space is a wet bath. You get all the perks of both the shower and the toilet without sacrificing precious space to dedicate to them individually. 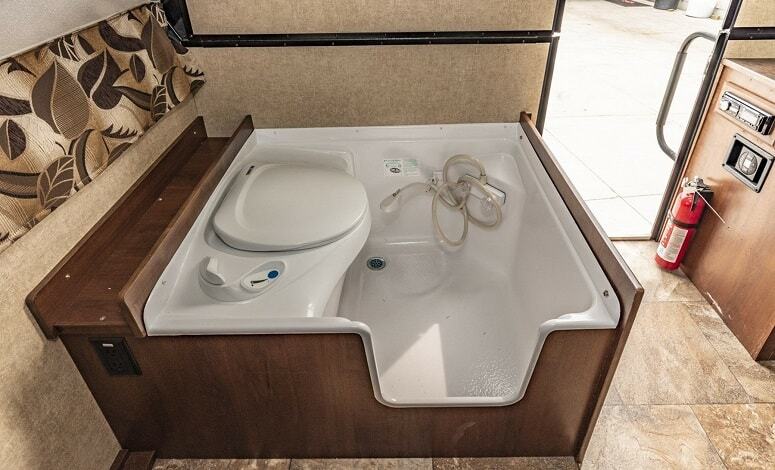 A 2.5-gallon hot water tank, a 23-gallon fresh water system, and a composting toilet give you everything you need in an equipped camper bathroom. As if that isn’t enough, this camper is made with non-harmful materials and designed to be eco-friendly and energy efficient. We love the large kitchen area and the flexible interior. This is the kind of camper you can shape to fit your exact needs—what’s not to love about that? If you’ve been looking for that rare gem that gives you the memories and adventures you crave, without the headaches that come along with bigger vehicles, campers with a toilets are great option. 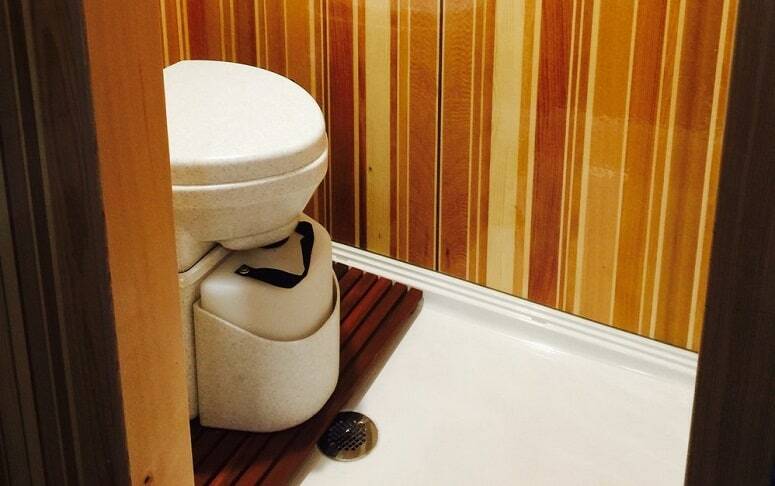 Have a trailer with a great bathroom we’ve missed here? We’d love to know about it—and I know people on the hunt for a new camper would appreciate it, too. Leave us a note in the comment section below.